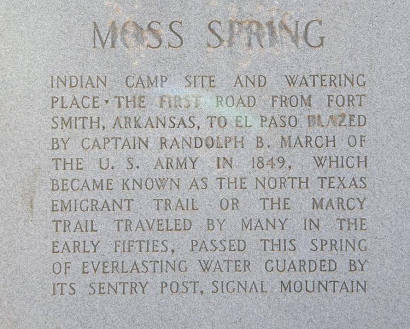 Moss Spring Centennial Marker in Howard County Texas. When I first decided to try to locate the 1936 gray granite Moss Spring Centennial Marker in Howard County, the first place I looked was in Sarah Reveley's 1936 Marker Inventory List. Sarah is a volunteer working with the Texas Historical Commission trying to locate all of the markers that were placed in 1936 as part of Texas celebration of the centennial of its independence from Mexico. Through the years the locations of many of these markers have been lost or misplaced. Her listing for Howard County, whose county seat is Big Spring, simply says "Moss Spring Marker - 11 miles northeast of Big Spring." This is the same location published by the Centennial Commission itself back in 1936. I pulled out my maps of the area to see what roads were around 11 miles northeast of Big Spring. Hmm, SH 350 runs northeast from Big Spring. That�s easy enough. Maybe the marker is visible from the highway. Next, I looked in the notes of my mentor, Ruthie Cade. She is the one who started this quest to find lost Centennial markers eight or ten years ago. Ruthie contacted Sarah after reading an article in a newspaper about Sarah�s work in locating these neglected markers. Ruthie loaned Sarah her photos and notes. Sarah had sent me Ruthie�s notes but I had never been directly in contact with Ruthie. I wanted to see if Howard County deserved any special notations from Ruthie. For Howard County her notes read, �Moss Spring - This marker was the hardest to get to both in finding a contact and physically walking to the marker." Okay, sounds like I can't just drive up to this one. Then she added, "The owners of the property are very reluctant for the public to go into this area." My assessment of the situation so far is, first, this marker is going to be hard to find, second, the marker is physically hard to get to, and third, the land owners don't want you there in the first place. Quickly calculating my Marker-Challenge-Rating on a 1-5 scale, the Moss Spring marker is easily a 6. At least Ruthie does list a contact number so I called it. As her notes are several years old, the all too familiar recording came on saying, "Not a working number." Well, so much for prior planning. I was going to be in Big Spring anyway to see other historic sites and markers and to see the 1938 WPA Mural painted by Peter Hurd in the U.S. District Court Building right across from the Howard County Courthouse. At the district court building, I asked the clerk if anyone around there could help me locate an historical marker in the county. She referred me to the Chamber of Commerce which was just one block away. The Chamber Historian was very helpful. She gave me a brochure listing all of the historical markers, buildings and houses in Howard County. While this is one of the finest brochures of its kind that I have seen from any county in Texas, it made no mention of the Moss Spring Centennial Marker. Obviously the Moss Spring Centennial Marker was not a big tourist attraction. 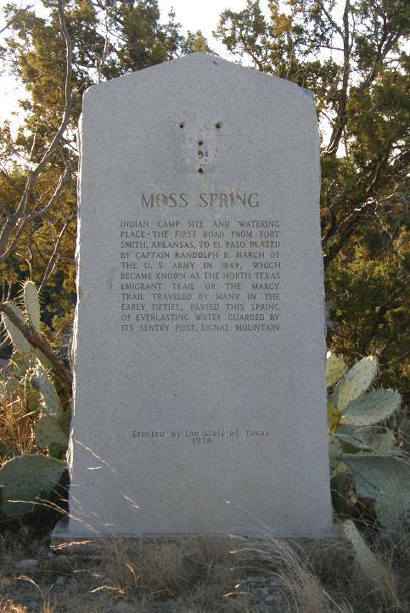 By now I had decided that the Moss Spring marker was very likely near Moss Lake, well duh, which was about nine miles southeast, not 11 miles northeast, of Big Spring. Now I�m getting somewhere. "...40 or 50 years ago the marker was easily reached from the north side of Moss Lake. It was a well known swimming hole during WWII where airmen training at the local Army Air Field came on weekends with their wives and girl friends to swim and hike to the distant Signal Mountain." I asked the Chamber Historian if she knew how one might be able to see the marker. She gave me the number of Charlene. The number sounded familiar. As it turned out, it was the same number listed in Ruthie's notes with two numbers transposed, 98 for 89; an easy mistake for anyone to make somewhere along the line. I called Charlene who was very helpful. She was busy at the moment but would be glad to help me see the marker at a later date. I asked if many people had bothered the land owners to see the marker. She said that as far as she knew, no one had been there since she and Ruthie had visited it several years ago with the help of a friend who grew up in the area. That conversation was December, 2009. 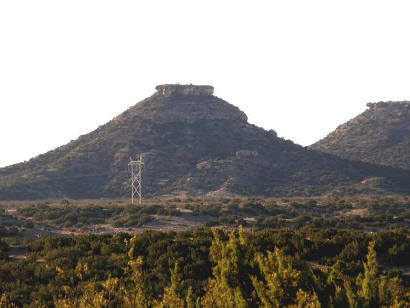 The first chance I had to go back to Big Spring was in late January, 2010. I called Charlene about a week ahead of my visit, and she said she would get me the phone number of the man who had taken Ruthie and her to the marker. She called back with the number of a man named John who said he would be glad to show me the marker. I called John, and he said I could meet him at his house just after sunrise and go from there. After our conversation, Charlene called Ruthie, and mentioned that a Barclay Gibson was interested in seeing the Moss Spring marker. Charlene gave Ruthie my number and Ruthie called me. It so shocked me that I could hardly speak. I had never spoken to Ruthie before and had only followed in her footsteps in locating Centennial Markers. It was like being called by the head of an organization for which you had been volunteering. In warning me about walking to the marker, she cautioned, "Be sure to have good walking gear." To say the least, it was an interesting conversation. On the appointed day, I drove up to John's house. He was already out and ready to go. I asked if we might take both pickups so I could go on from the marker for the rest of my trip. He said it would be best if we went in one truck and offered to drive me there and back. The weather was clear and cold, about 30 degrees. The marker was about three miles from his house, as the crow flies, but about 14 miles driving distance. We were north of the lake and had to drive around it to approach the lake from the south. John didn't own the land but had known the owners for many years having ridden horseback over that country since he was a boy. 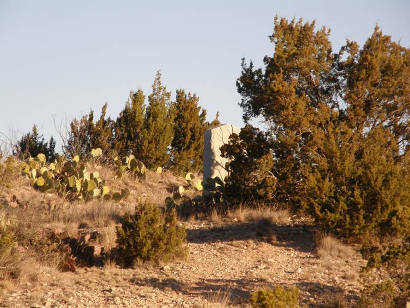 The landowners were very protective of their property and one would have to drive right by the ranch house on the way to the marker. Ignoring the large, ominous warning sign is not advised. While driving along, John said that it would be nice if the marker could be moved to a more accessible location, but that it would cost about $25,000 to move it. 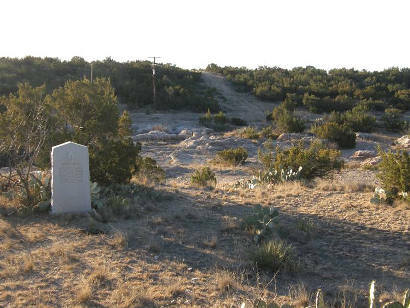 That sounded way out of line as I knew about several recent relocations of these granite markers where the county usually provided the manpower and equipment to move the 2,000 pound marker. He also commented that this would be the first time he had been to the marker since he took Charlene and Ruthie several years ago. John told me that 40 or 50 years ago the marker was easily reached from the north side of Moss Lake. 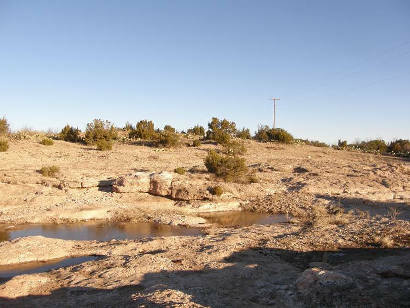 It was a well known swimming hole during WWII where airmen training at the local Army Air Field came on weekends with their wives and girl friends to swim and hike to the distant Signal Mountain. After the war, a gravel company worked the area for a number of years. When the company closed, John said that now he could hardly ride a horse to the lake from the north side because of the piles of boulders, rock and gravel. We drove and drove, first down paved roads, then on 'improved' oil field roads, then down rutted paths until we finally got to the place where we had to walk about one-half mile to the marker. Strangely, actually seeing a marker is sometimes kind of a letdown. There is so much planning involved, and then the time and effort to physically get to it. So here we were at the marker. We talked about why it might have been placed there back in 1936, how vandals had stolen the bronze wreath and star, and had even chipped away some of the granite inscription. I took pictures of the marker from different angles and some with John beside it. That was it. My objective was to see it. I saw it. While I was certainly appreciative of seeing the marker, John would not accept any payment for his time and gasoline. He only asked that I send him pictures of him standing next to the marker which, of course, I did. After seeing the location of the marker, John's estimate to move it doesn't seem all that out of line. Any heavy equipment would have to be trucked in. A winch truck couldn't get there and a tracked crane would cause too much damage to the area. Maybe a high-centered wheeled crane that bridge builders use to put up huge bridge girders at highway intersections would work. Even $25,000 might not be enough. "We drove and drove, first down paved roads, then on 'improved' oil field roads, then down rutted paths until we finally got to the place where we had to walk about one-half mile to the marker." 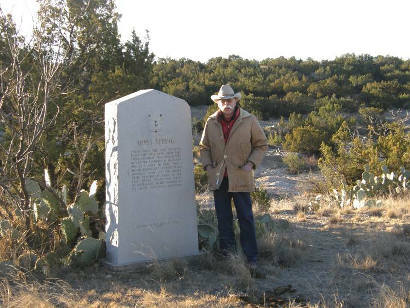 For this little story, I will only list the location of the Moss Spring Centennial marker as about nine miles southeast of Big Spring near Moss Lake. If anyone is interested in visiting it, the best place to start is where I did, with the Big Spring Chamber of Commerce. My special thanks go to Charlene, Sarah and Ruthie, but especially to John for not only taking his time to take me there, but also for his very enjoyable conversation and stories. "Remember the Warning Sign has a quantity discount for both barrels of the shotgun." 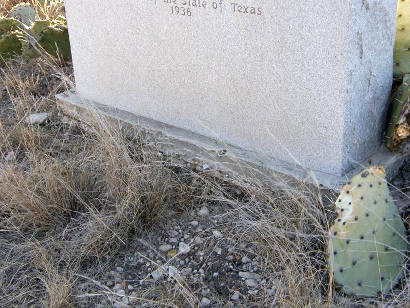 If anyone is foolhardy enough to try to see the marker on their own make sure you have good boots and long pants for protection from cat claw and mesquite thorns and for protection from rattlesnakes in warmer weather. 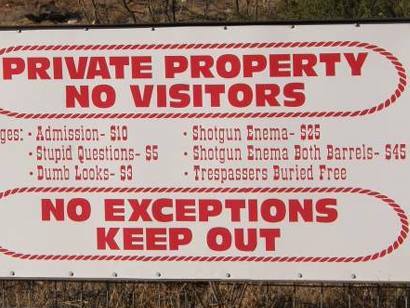 Carry some water, snacks, camping gear and bail bond money in case you are lucky enough to be hauled in for ignoring the No Trespassing signs. 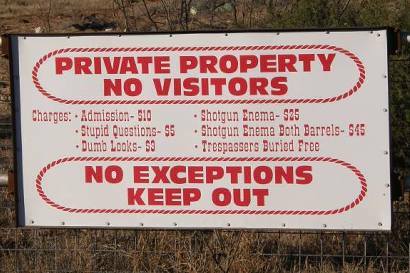 Remember the Warning Sign has a quantity discount for both barrels of the shotgun. Above all, be sure to tell someone where you are going so the rescue team will know at least where to begin their search for you. "Vandals had stolen the bronze wreath and star, and had even chipped away some of the granite inscription." "While I was certainly appreciative of seeing the marker, John would not accept any payment for his time and gasoline. He only asked that I send him pictures of him standing next to the marker"